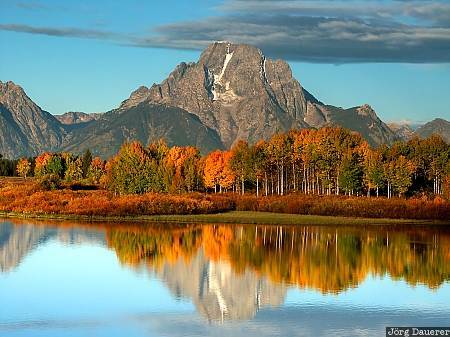 Mount Moran and its reflexions at Oxbow Bend in Grand Teton National Park with colorful autumn trees in the foreground. Grand Teton National Park is in the west of Wyoming, United States. This photo was taken in the morning of a sunny day in late September of 2003. This photo was taken with a digital camera.